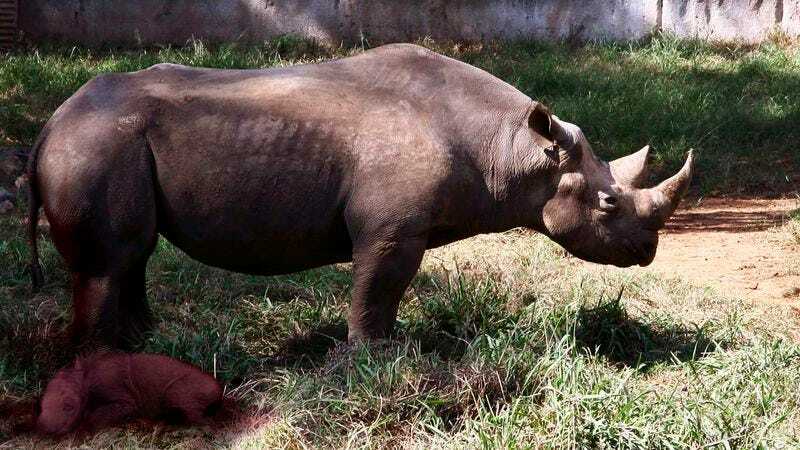 SAN DIEGO—The San Diego Zoo continues to welcome the record crowds coming from far and wide to see its latest attraction: Ren, the first Indian rhinoceros stillborn in captivity. “What really captivates people about Ren is that he was born far too early and came into the world as just the tiniest little expulsion of mucus-covered fetal tissue,” said animal keeper Jeff Cooperman, speaking to reporters Friday about the zoo’s newest superstar. “Everybody loves Ren, from the schoolkids who voted in our “Name the Dead Rhino Fetus” contest to the grownups who are charmed by the way he just lies there by his mom and are quick to notice the miniature tip of his underdeveloped horn nub.” Additionally, Cooperman noted that the gift shop’s bestselling items were lumpy, red-flecked stuffed toys made in the likeness of Ren.